The temple consecration is called the kumbhabhishekam. Literally, this formidable term means the “sprinkling” (abhishekam) of the temple with sacred waters carried in a “water-pot” (kumbha). This is the most important ritual in the life of a newly built temple. 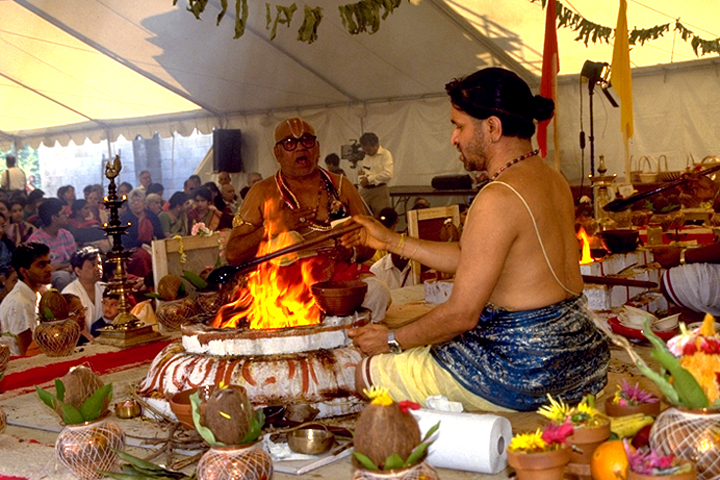 It is especially significant for the many Indian communities that have built new temples in the United States. 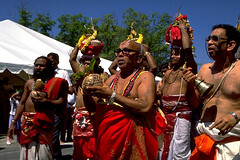 Every year they will observe the anniversary of this event as one of the temple’s major festivals. The consecration rites extend over several days. The first rite in the series is the honoring of Ganesha, the Lord of Beginnings and the Remover of Obstacles. There will also be prayers to the earth (bhumi puja) for the support and blessing of the new building. The priests will tie a thread of blessing and protection (raksha bandhanam) around their wrists as they commit themselves to the rituals ahead. Sometimes grains will be planted and sprouted to assure the fruitfulness of the rites. The main rites take place in a large tent erected adjacent to the new temple. The tent becomes a yajnashala, a “House of the Fire Offerings,” where the powerful rites of consecration are performed around the brick fire altars that have been constructed for the occasion. Surrounding the fire altars are hundreds of kumbhas, or copper pots, sponsored by various members of the community. They are filled with Ganges water and often the waters of U.S. rivers such as the Missouri and Mississippi as well. Each pot is topped with mango leaves and a coconut and each sits on a bed of rice, the picture of sheer auspiciousness. At the brick fire altars sit the participating brahmin priests or acharyas, the learned ones, who kindle the fires and make offerings and libations into the fire. 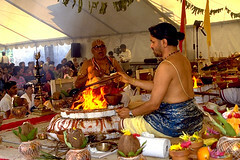 They chant the mantras and sacred texts that invoke the Divine presence to the fire altar and to the pots of water to be consecrated. It is through these powerful words, mantras, that the Divine is made present. The “root mantras” (mula mantras) are different for each deity installed in the temple. 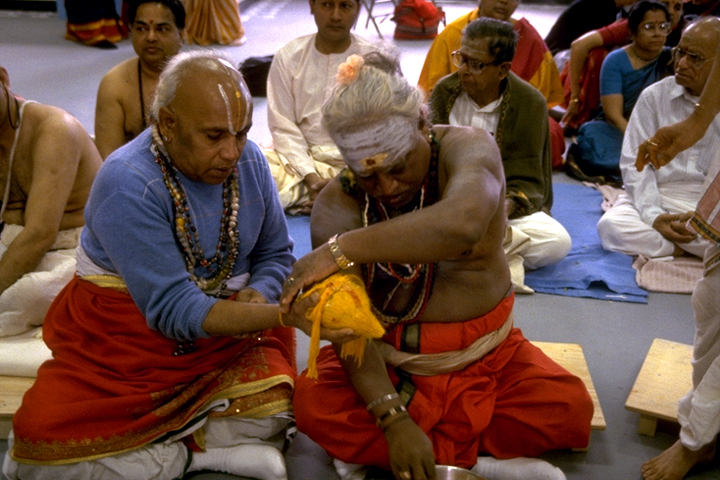 The recitation of the mantras and the hymns required for these consecrations often takes hours and makes plain to young Americans the traditions of sacred memory these priests have preserved. The rites of consecrating a temple include and parallel the rites of consecrating its primary images (murtis) of the gods. At the conclusion of the rites, priests will circle the temple in festival procession bearing the largest of the kumbha pots on their heads. Hoisted to the temple roof on hydraulic lifts, they sprinkle the waters of consecration over the cupolas and on the eager crowd assembled below.